Boom! Despite many industry pundits taking analysts reports with a grain of salt, we all collectively wait with baited breath for Gartner’s cloud Magic Quadrant. For those unaware of the Gartner methodology, the Magic Quadrant (MQ) is a simple chart which ranks vendors on two axes< their completeness of vision and their ability to execute. Pretty much every year we wait to see how far Amazon Web Services (AWS) is ahead of the pack, but this year’s report has some very interesting result – indeed, while the relative placings are of interest, it’s who’s not there at all which will make some vendors wince. Let’s get the first thing squared off. As it has been since the public cloud was first invented (appropriately enough, by Jeff Bezos and his merry band of booksellers), AWS is at the preeminent position – up and to the right. AWS has been in front from the start, comes from a bigger base and seems to move faster than the others. So their position is no real surprise. 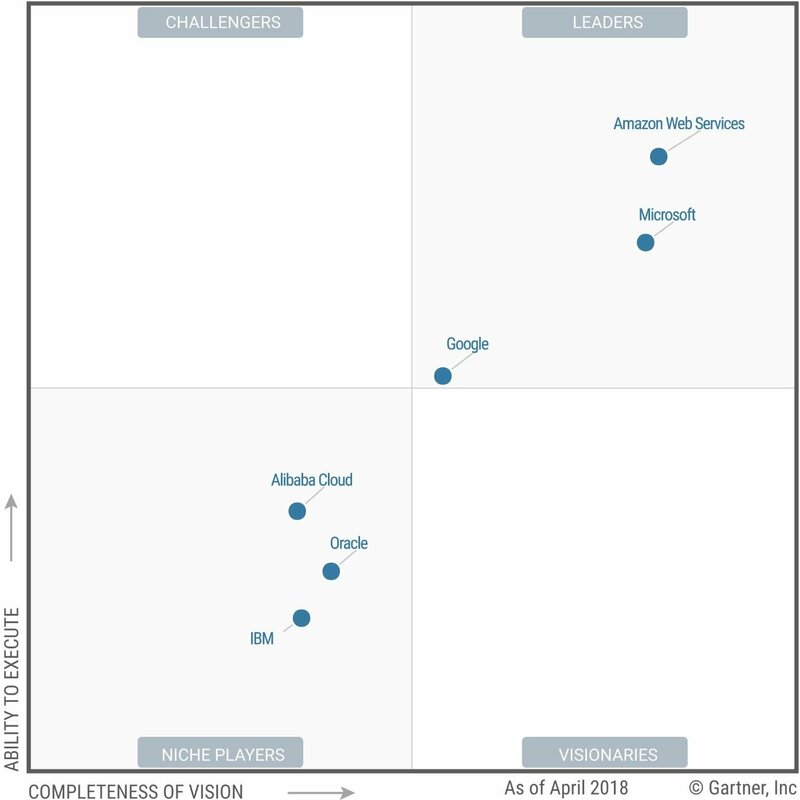 Interestingly enough, Azure, Microsoft’s own cloud offering, seems closer to AWS than in recent years – Gartner sees the two as having a similar rating in terms of their completeness of vision, but AWS scored more highly on its ability to execute. The perennial third place winner (well, unless you ask IBM, but that’s another story) is Google. The company is a bit late to the party and it’s fair to say that it’s massive experience in running the biggest clouds in the known universe hasn’t rapidly translated into being able to actually sell public cloud offerings. Google is somewhere around the midpoint – both in terms of its vision, and its ability to deliver upon that vision. There aren’t too many other vendors that made the quadrant (more on that in a bit) but Alibaba, Oracle, and IBM make the grade. They’re all kind of bunched together but Alibaba, the Chinese monster that is less well known in the West, comes up in front of Oracle with IBM trailing a little. This is all very interesting as, broadly speaking, we see Alibaba, the emerging vendor in the market arguably best poised for stratospheric growth, come in ahead of two vendors who are very much the opposite – sunset players trying to eek out some legacy revenue from generally legacy customers. Oracle is both late to the part and predatory in terms of its monetization strategies, while IBM, after spending years denying the cloud, is too busy enjoying (!) recurring quarterly revenue figures trending downwards, to actually do the right things to secure its future. Innovator’s dilemma and all that. Oracle sometimes uses high-pressure sales tactics to sell its cloud IaaS offerings, including software audits or threatening to dramatically raise the cost of database licenses if the customer chooses another cloud provider. Customers should be cautious of these tactics, thoroughly understand their options and evaluate the risks of adopting Oracle Cloud at this stage of its maturity. This year sees eight clouds disappear from Gartner’s analysis – Virtustream, CenturyLink, Joyent, Rackspace, Interoute, Fujitsu, Skytap, and NTT are all seen as pretty much irrelevant in the scheme of things. I can just imagine the wincing that is occurring in the boardrooms and palatial executive offices of those vendors. Gartner’s not taking any prisoners, it seems. The MQ reinforces what many of us had already assumed, but it does it in a very stark way that leaves customers in no doubt as to where they should, and they should not, be investing their cloud spend. It would be a brave analyst that recommended that any customer went out on a limb that wasn’t carved with the initials of AWS, Microsoft or Google. Yet again reinforces the fact that, when it comes to public clouds, it’s a three-horse-race.